Sliiiiiiiiiinky - Video of waves and gyrations! Sliiiiiiiiiiiinky - Video of waves and gyrations! 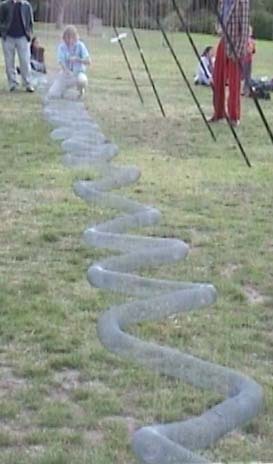 Back to the main page for the 21 metre (71 foot) long Slinky - including photos and two-channel piezo pickup sound recordings. Back to the First Principles site for all sorts of fun-and-games, show-and-tell, DSP, etc. All files copyright Robin Whittle 2002. Please contact me at rw@firstpr.com.au if you want to use them for any commercial purpose. to your hard drive and use Real Player (or another program for the MPEG-1 file) to play it from there. These videos were shot on a Sony TRV17E, transferred to computer and converted to Real Video 8 files, with a data rate of 512 kbits/sec, and resolution of 320 x 240 pixels - which is the maximum which seems to be possible. This seems to produce a better result than Video CD MPEG-1 352 x 288 pixels at 1,150 kbps (not counting the audio). These files can be played with Real Player which can be freely downloaded from http://www.real.com . Beware of them trying to sell you a full-featured version. You may have to ferret around to find the free version, but it is there, and its URL changes, so I won't give it here. In April 2002, the one to get is the "Free RealOne Player" - and you don't need to fill in the account information at install time in order for it to work. The old Windows 98 (?) / 2000 Windows Media Player 6.4 from 1999. Current (April 2002) RealOne Player 6.0.10.505. The latter three programs are freely available for Windows and Mac, but I am not sure about RealOne for the Mac. These videos are from the Sliiiiiiiinky Outing at Beckett Park on 6 April, with music by the Wandering Stars. Theresa gives Sliiiiiiiiiinky a good workout! big-wiggle-1.rm 1.59 Megabytes 26 sec. Real Video. big-wiggle-2.rm 2.47 Megabytes 42 sec. Real Video. big-wiggle-2.mpg 16.62 Megabytes 42 sec. MPEG-1 3Mbps. Please excuse my amateur camera work. Standing waves occur when two waves of the same frequency are traversing a medium in opposite directions. The result is that some points in the medium become "nodes" and do not move at all, while the medium between these nodes does move a lot. The nodes are at half-wavelength spacings. Here I am sending 1 Hertz horizontal waves, by trying to synchronise my hand movements to a watch's second hand. The waves lose energy as they travel, so near the camera, they are only about 1/3 the size. When these waves hit the end, which is being held still off-camera, they reflect back towards me. (They would reflect if the end was loose too.) Near the camera end, the reflected and non-reflected waves are about the same amplitude, so we see full standing wave patterns. Further towards me, the non-reflected waves are stronger and the reflected waves weaker, so the effect is diminished. slinky-standing-waves.rm 2.04 Megabytes, 37 seconds, with sound. Devil Fish assistant Ceri Hann is on camera and gives a brief discourse on how this phenomenon relates to Bootsy Collins' exit from the James Brown band. 2002 April 14: Created, with two Big Wiggle and one Standing Wave videos in Real Video, with the second Big Wiggle also in MPEG-1 3Mbps.